Shmuel Blitz and his brilliant children’s books never cease to amaze, this is his seventh book -- and they just seem to get better and better. This time, he puts his talents to the task of creating a Children’s Haggadah, and the result is one that will be enjoyed by child and grown-up alike. 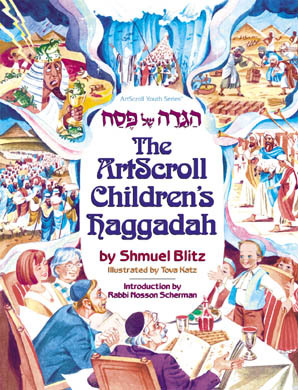 Specifically written for children ages 4-8, the full Hebrew text of the Haggadah is accompanied by a child-oriented, yet accurate English translation. There are clear, precise instructions that will guide the child through every stage of the Seder. And, each page contains a box that provides additional information about the Pesach narrative for the interested youngster. The breathtaking, full-color illustrations make the story come alive – this Haggadah will be an invaluable addition to your child’s Seder (and to yours)!